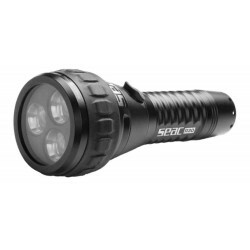 Seac R30 LED Scuba Diving Light. The Seac R30 is the most powerful of the Seac range of dive lights. 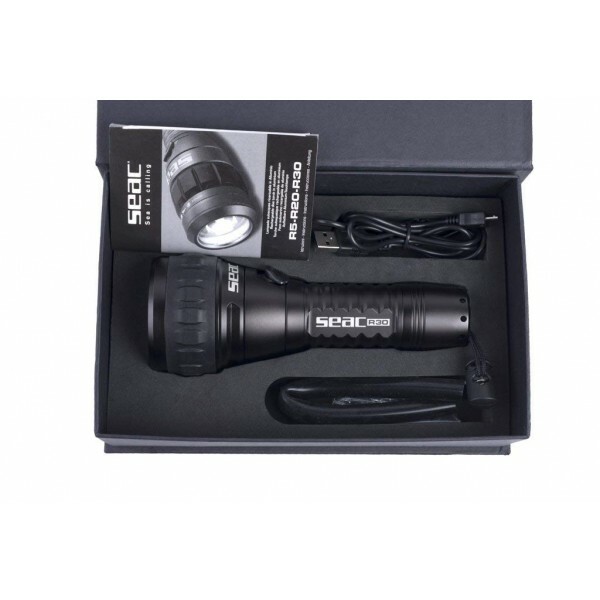 With its 1500 lumens of brightness from a state-of-the-art CREE XM-L2 LED with a smooth aluminum reflector, it guarantees optimal visibility even under the most extreme conditions. Light has a color temperature of 5700K-7300K. 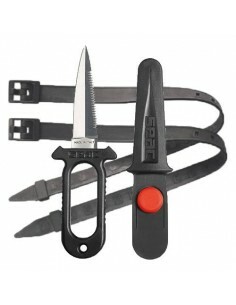 The R30 Handheld Light has an adjustable beam angle from a narrow penetrating 12 to a wide 75. Light has two brightness modes of 1500 lumens and 750 lumens. Powered by rechargeable 26650 lithium-ion 5000 mAh battery with life expectancy of more than 500 recharges. Freshly charged battery will provide 2 hours of burn time in high mode and 4 hours at low lumen power. Light has three power modes of maximum 100%, reduced 50% and strobe. This durable light has a double O-ring seal system and electromagnetic switch system giving it a 330 (100 meter) depth rating. Light has an optical quality tempered glass lens, measures (Dia. X L) 2.17 x 7.3 (55 mm x 185 mm), and weighs 17.5 oz. (496 g). Light comes with a wrist lanyard, USB charge cable and owners manual.